Every once and a while when the planets align and God is smiling on me, a photo shoot goes much better than I could have ever dreamed or planned. 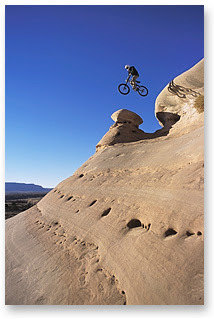 I had such an experience in November 2001 while photographing five downhill mountain bikers in Moab, Utah. Kris Baughman, Ryon Reed, Lance Canfield, TJ Cowern and Nate McKay re-defined for me what is possible on a mountain bike that weekend. Whether they were dropping thirty-five foot jumps onto slickrock or riding near vertical 60-foot slickrock cliffs, the risk factor was very high. This has to be some of the craziest stuff I have ever seen. These guys were going for it. And when I say going for it I mean they had to take ten to twenty minutes to get their heads together before they went. There was no room for error. Luckily in our three days of shooting no one was injured and I came home with 30 rolls of amazing footage. If you haven’t figured it out yet these riders are BOLD! I have photographed a lot of risky sports in my time but this easily takes thecake. If you mess up on a 30 + foot drop onto Slickrock you’ll be spending the next few months in the hospital if you are lucky. We also photographed a new 7000 foot descent from the La Sals into Moab that easily qualifies as the longest single track descent in the world. Not only is it long (37.5 miles) but it also has frequent big jumps built into it. And by big I mean 30 plus foot drops threading through tight aspens. In the photo at right TJ Cowern is getting some big air off a small jump at full speed (i.e. 30 + mph). These guys are part of a new revolution in mountain biking called freeriding and downhilling. Freeriding blends BMX stunts with modern mountain biking while downhilling involves descending technical mountain and canyon slopes. These riders are experts at both styles. I was impressed by their ability to read a slope and know what is and isn't possible or safe. As Ryon Reed put it, "we are not just 'hucking' ourselves off any old cliff. We use the experience we have aquired from years of riding. This isn't a sport you just start doing one day. You have to build up to this level over a number of years." These riders have suffered a number of injuries. Kris Baughman, nicknamed "Krispy", has broken his back and I personally witnessed Ryon crash hard the first time I photographed him. Thankfully he was uninjured but his bike was not so lucky. When he hit the ground his front wheel exploded. Spokes were flying eveywhere and the rim was taco'ed. Feeling responsible, since we were out there just for photos, I bought him a new rim. These guys are not doing these stunts on your average mountain bike. These are seven to ten thousand dollar machines weighing fifty pounds or more. Riding uphill isn't an option. These bikes are full suspension and designed with a foot of travel or more in the front and close to that in the rear. They are also equipped with beefy frames to take the shock of hitting the ground at seventy miles an hour or more. Depending on the jump the riders can acellerate to near eighty miles an hour before hitting the ground. Gravity is pulling on them at 9.86 meters per second squared. Multiply that by ten meters or more and add in their initial velocity and it is one hell of a roller-coaster ride. There were moments when I was seriously concerned for the safety of the riders on this shoot. One such moment was a jump they deemed "Where the sidewalk ends." We were looking around at new territory on the unexplored side of Bartlett Wash and they came upon this ramp that ended over a very steep slickrock bowl. When they first started discussing jumping off of it I was wondering if they were really considering it or if they were just dreaming about it being possible some day in the future. I asked and Kris and Lance said they were going to do it. When l looked over the edge I thought that now someone was definitely going to get seriously injured. Lance went first and nailed it beautifully. There is no 'practice run' in this sport and there are no second chances. Kris took a little more time and set up his line meticulously. After a short breather to calm the mind he went for it and got huge air. Even though these images might look spectacular they don't necessarily give you a feel for how steep the jumps really are. Needless to say, I was very relieved to move on to other less risky projects. The images to the left and below are of a modern classic freeride descent. This formation is called the Mushroom beacause of it's distinct shape. When these images where shot there were only eleven people in the word who had done it. Three of them were with us that morning. And TJ and Nate expanded that number to thirteen. All five of the riders jumped off the Mushroom at least three times for me that day at dawn. By the end they had it so dialed that it seemed casual, at least to an observer. Ryon (photo at right), on his first go a few weeks before leaned back a little too far and ended up riding a wheely down the steep transition. He said, "It looked like the space shuttle landing!" I wasn't there to see it but I am sure it looked amazing. That wasn't what he was intending to do and I am sure it raised his heart rate a little more than he would have liked. On our shoot, he nailed it three or four times in pefect style. He seemed to get more air off it than anyone else and as a result the images of him are more exciting than of the others. As you can imagine I went through film like crazy. I was shooting at eight frames per second all the time on my Nikon F5. On an average jump I shot 17 frames which is roughly two seconds of hang time. The F5 did a spectacular job of keeping up with the riders even when they were coming staight at me at thirty to forty miles an hour. All in all, I came back with some amazing images many of which will, I am sure be published soon.